So following on from my Poppy make from sweetie wrappers here is my second tutorial for Gingersnap Creations. It is a quickie this time - the Poppy make was a little on the long side so this one balances that out. 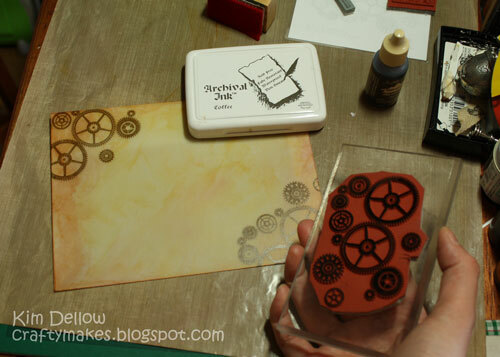 Ok so you know that this month on Gingersnap Creations is all about using packaging in your art right? Well I've kinda cheated a bit for this tutorial. This one is making packaging rather than made from packaging! My envelope is a very simple design and I made the template from an A4 piece of paper to make an 18 cm by 13.2 cm (7 1/8 inch by 5 3/16 inch) envelope when folded. I used my scoring tool and craft knife to make the envelope from the vellum and stuck the side flaps down with the vellum glue tape. To change the colour of the vellum I used the blending tool and alcohol inks. For this techniques I added two or three drops of the alcohol ink to the felt on the blending tool then added one drop of the blending solution and then using circular motions worked from the outside inwards. 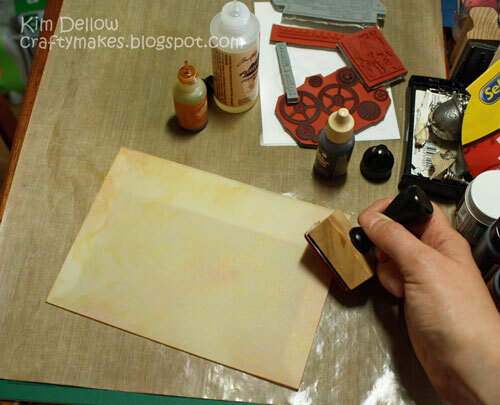 I started with the lightest colour, the Butterscotch, to colour the whole envelope then added a bit of the darker Terracota colour to the edges and corners. Then when you have the colour the way you want it try adding a bit of texture by adding drops of the blending solution to the blending tool, without colour, and 'stipple' the blending tool onto the envelope, i.e. dab it onto the envelope and lift directly up without moving it sideways. You can see the effect in the close-up photograph at the bottom of this post. 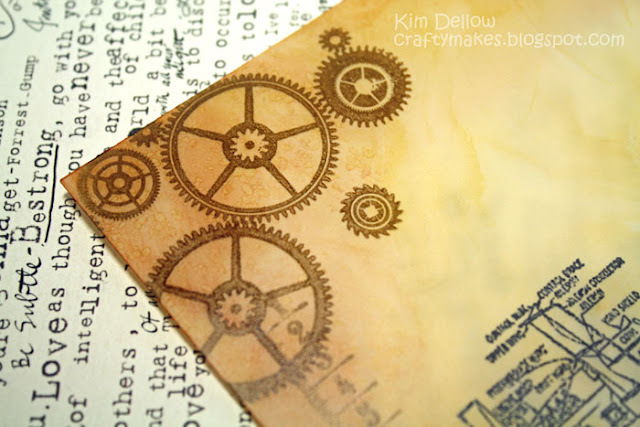 I used the Coffee Archival ink with the PaperArtsy C5 and HPXT01 stamps as my background stamping then stamped the sentiment and airplane from the Creative Expressions Vintage Aviation kit with Jet Black Archival ink. 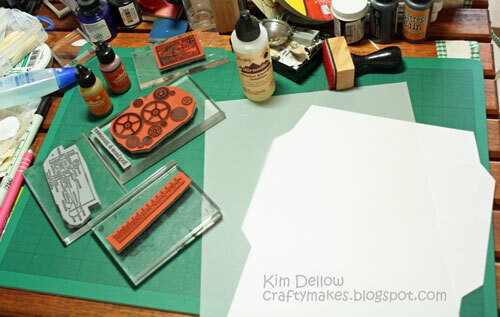 To stamp on vellum just remember to try not to wobble or slide the stamp when it is on the vellum and I also use a bit of careful heat from the heat tool to help dry off the ink after each stamping. I just love the effect of the alcohol inks on the vellum almost like the glassine papers that are very popular at the moment don't you think? Hope you enjoyed this tutorial, have fun with it! This is really brilliant, I love your project. Thanks for the tut. Very beautiful! 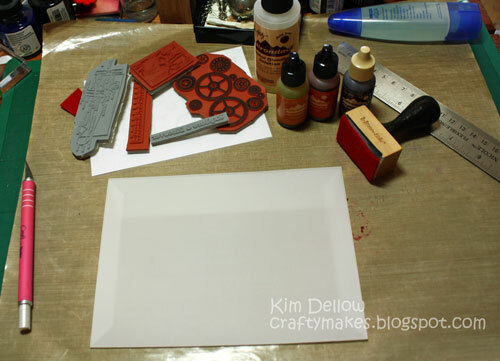 I love anything with vellum, excellent! Now that is one fabulous envelope! I love it! Alcohol inks on vellum...of course! Oh, I just had a 'duh' moment! Must try that. Thanks for the inspireation. 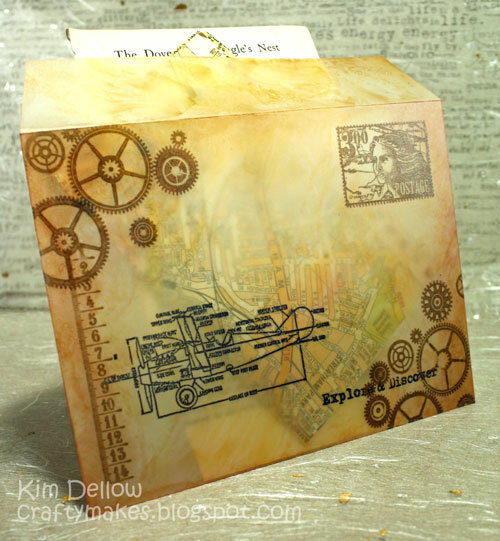 Kim , thank you so much for sharing with us your wonderful art! This project is so brilliant! What an awesome way to dress up a project! Totally inspiring! Never even thought to use AI's on vellum. Wow this is a must try. I love this and of course decorated envelopes are always a must. Great job. A brilliant project. Love the way the envelope turned out with their ink treatment!